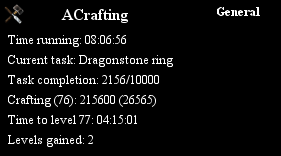 Complete crafting script, supporting virtually every item in the game. Featuring an item queue, users are able to create their own path to skill mastery! 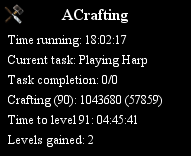 THANK YOU for 99 crafting. =]. 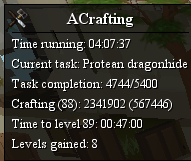 Bought your smither/crafter/slayer. Hope to have 99 slay/smith by sunday! EDIT: the script goes very slow and only takes out 9 G'hides instead of a full inventory. after it crafted the 3 G'hide bodies it went back into the bank and stopped. I'll check it out. I'm not really sure how much I can speed up banking, because the client is taking quite some time to parse all items in bank. I'm testing presets as we speak and it shouldn't be that long until they are added. It's a planned fetature and will be added soon. I'll make it faster with next updates. A lot better :) But the withdrawing and depositing takes forever, otherwise awesome! - Added Prifddinas harp playing. It works faster if you have less items in bank. I'll think of something to make it faster. The script won't make air battlestaves. As soon as it withdraws the orbs and staffs it closes. If I start with them in my inventory then it closes immediately. Battlestaff issue has been fixed. Next up are inventory presets. It takes a little more time than expected and it will be added in the following days. You could just put a disclaimer telling the user to have their presets already configured. It would not be really practical if the user is making more than 1 type of item because the script wouldn't know which preset to use then. That's one option. If I don't finish presets until tomorrow I'll add this. 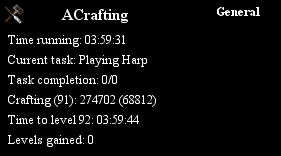 The script would be MUCH better if it tuned the harp any time before 50%, preferably varying so it acts as an anti-ban. Good idea, needs improvement. Doesn't seem to work. As soon as i click the script to start, it tells me it's done and stops. - Added Inventory presets support. 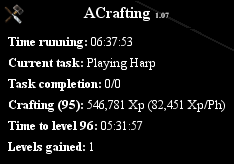 - Updated Prifddinas harp playing. It will now tune randomly somewhere near 50% out of tune. Thanks for suggestion, I've updated it.